Antimicrobial, Dental caries, Glycyrrhiza uralensis, Streptococcus mutans, Natural herb. The oral cavity is a space that constantly maintains invasive conditions due to the saliva, and is an environment whose constant humidity makes it an ideal place for bacteria to reside in. Thus, in the human oral cavity, more than 700 kinds of bacteria exist, which affect the oral health and morbidity . Bacterial flora in morbidity form dental plaque in the human oral cavity, which causes bad breath, dental caries, gingivitis, and periodontal disease [2,3]. According to the recent report of WHO on dental disease, 60% of adults worldwide experience dental caries and periodontal disease . They are thus regarded as the two major oral diseases and are caused by the bacteria residing in the oral cavity . Dental caries occurs when the tooth enamel is demineralized as it interacts with the food residues in the oral cavity and with the acids generated by the bacteria in the dental plaque and is a typical irreversible chronic disease that frequently occurs in all ages [6,7]. It is mainly caused by the human oral cavity’s resident oral bacteria called “Streptococcus mutans (S.mutans)” . S. mutans is capable of adhering to the tooth surface and releases glucosyltransferase (GTase) . GTase produces glutinous glucan, whose stickiness makes it easy for S. mutans to adhere to the dental plaque. In addition, as S. mutans’ acid-producing ability is high and as it tolerates acid well, when the pH becomes lower than 5.5, the tooth enamel’s demineralization process is started, and dental caries is developed . As the destroyed tooth structure cannot be recovered, there is a growing demand for antimicrobial substances that can inhibit bacterial growth to prevent dental caries [6,11]. Studies on the inhibition and prevention of dental caries have been continuously carried out of late . Among them, there has been an increasing interest in inhibiting bacterial growth using natural substances, and various studies have been conducted by using them as therapeutic agents for diseases, prevention measures, or dietary supplements [9,12]. It has been reported that the ethanol extracts of medicinal herbs, such as Crataegi Fructus, Coptis japonica Makino, Thujae Orientalis Folium, and Atractylodis Rhizoma, have a strong antimicrobial activity against both Gram (+) and Gram (-) bacteria, and that the extract of Mori Cortex Radicis inhibits the proliferation of L. monocytogenes . Additionally, various medicinal herbs, such as Schizandra cheinensis, Curcumae longae Radix, Jacho, and Sophorae Radix, have been known to exhibit antimicrobial activity [14-16]. Among the medicinal herbs that exhibit antimicrobial activity, Glycyrrhiza uralensis is a perennial herbaceous plant belonging to the soybean family that is used as a medicinal material by drying the roots, and was given its name due to its sweet taste. It also has a strong growth potential and is less damaged by harmful insects, making it easy to cultivate in places with suitable climates and soils. Due to these characteristics, Glycyrrhiza uralensis has been cultivated in China and North Korea for a long time, as part of such countries’ herbal resources . The main ingredient is a large amount of phenolic groups that have bactericidal action. Among them, liquiritigenin and isoliquiritigenin are known to have inhibitory activity against skin flora, including Bacillus subtilis (B. subtilis), Propionibacterium acanes (P. acanes), Escherichia coli (E. coli), and Pseudomonas aeruginosa (P. aeruginosa) and to have antimicrobial activity against the causative bacteria of Listeria food poisoning, L. monocytogenes, but the studies that apply Glycyrrhiza uralensis to oral diseases are not sufficient [18,19]. Therefore, this study aimed to investigate the anti-microbial activity of the natural substance Glycyrrhiza uralensis extract against oral bacteria by applying it to S. mutans, the main causative bacteria of dental caries, for the prevention and treatment of dental caries. Furthermore, this study intended to confirm the usefulness of Glycyrrhiza uralensis extract as an antimicrobial agent against oral bacteria as part of the search for the next-generation antimicrobial materials, and to provide practical basic data for the prevention and treatment of oralrelated infectious diseases by presenting the possibility of its being used as a therapeutic agent for oral diseases. For this experiment, 100 g of dried Glycyrrhiza uralensis grown in China was purchased. After adding 80% ethanol to 100 g of crushed Glycyrrhiza uralensis, the extraction was done in a heating mantle at 65°Ϲ for 12 h. The extract was filtered three times using filter paper (Advantec No. 2, Toyo, Japan), and the Glycyrrhiza uralensis extract was concentrated and lyophilized using a rotary vacuum evaporator (N-1300E.V.S EYELA Co., Japan). The strain of S. mutans (KCTC 3065/ATCC 25175) was used for the experiment after subculture in culture broth, which was anaerobically incubated in brain heart infusion (BHI; Sigma, USA) broth at 37°Ϲ for 24 h.
The antimicrobial activity of Glycyrrhiza uralensis extract was measured using the paper disk agar method . Experimental strains were inoculated into the BHI broth and were anaerobically incubated at 37°Ϲ for 24 h. The Glycyrrhiza uralensis extract was diluted to come up with a maximum concentration of 10 mg/ml. The 100 μl diluted extract at each concentration (0 mg/ml (control), 2 mg/ml, 4 mg/ml, 6 mg/ml, 8 mg/ml, and 10 mg/ml) was absorbed in an 8 mm filter paper disk (Advantec Toyo Kaisha, Ltd.), and then the disk was dried. The dried disk was placed on the surface of the test plate media, was adhered, and was anaerobically incubated at 37°Ϲ for 24 h. The clear zone (mm) around the paper disk was measured to examine the antimicrobial activity of the Glycyrrhiza uralensis extract. Each sample (0, 2, 4, 6, 8, and 10 mg/ml) was inoculated into BHI broth. After incubation for 24 h, 1 ml of Glycyrrhiza uralensis was uniformly smeared in a BHI agar medium and then cultured at 37°C for 24 h to confirm the number of CFUs. After incubation at 37°Ϲ for 24 h, the absorbance (OD) was measured with a UV spectrophotometer (SHIMADZU UV-1280, Shimadzu Co., Kyoto, Japan) at an absorption wavelength of 660 nm for determining the antimicrobial effect of the Glycyrrhiza uralensis extract. The antimicrobial effect of Glycyrrhiza uralensis extract on S. mutans that was examined by measuring the clear zone (mm) using the paper disk method is presented in Figure 1. The clear zone of S. mutans was found to be 0, 1, 13, 14, 16, and 18 mm at 0, 2, 4, 6, 8, and 10 mg/ml, respectively. Therefore, the ethanol extract of Glycyrrhiza uralensis showed antimicrobial activity against S. mutans. The higher the concentration of the Glycyrrhiza uralensis extract was, the wider the clear zone. 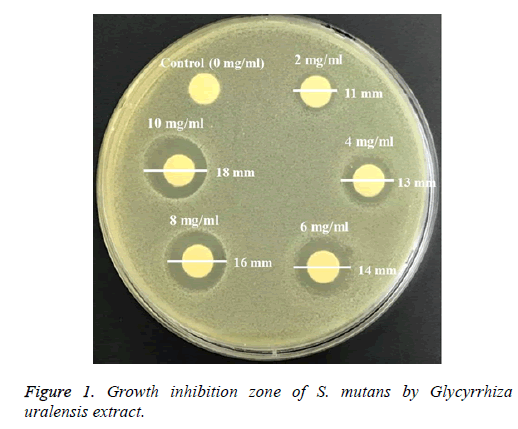 Figure 1: Growth inhibition zone of S. mutans by Glycyrrhiza uralensis extract. The forming unit of S. mutans against Glycyrrhiza uralensis extract on each sample that was counted is presented in Figure 2. The number of S. mutans was 0, 2, 4, 6, 8, and 10 mg/ml at 3.2 × 1012, 3.2 × 104, 3.8, 3.3 and 1 CFU, respectively. As a result, as the density of the extract increased, the number of S. mutans gradually decreased. 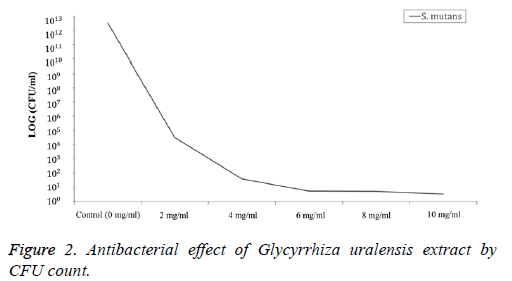 Figure 2: Antibacterial effect of Glycyrrhiza uralensis extract by CFU count. The viability of S. mutans by the Glycyrrhiza uralensis extract concentration in each sample is presented in Figure 3. The antimicrobial effect of Glycyrrhiza uralensis extract against S.mutans was observed at each concentration (2, 4, 6, 8, and 10 mg/ml), except at 0 mg/ml. 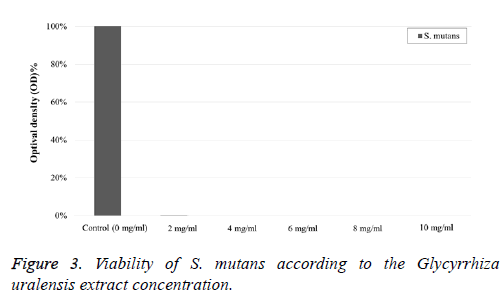 Figure 3: Viability of S. mutans according to the Glycyrrhiza uralensis extract concentration. With the increased interest in well-being of the consumers in the modern society, not only whole-body health but also oral health is becoming important. Therefore, it is natural for consumers to have a greater interest in and demand for natural ingredients rather than chemical ingredients, which have been reported to be harmful to the body. Therefore, research on and application of natural medicinal plants has been actively carried out in various fields. Oral health refers to the state of having teeth and oral tissues and structures with which the oral cavity can perform the three functions of mastication, aesthetics, and pronunciation . If one of these functions is abnormal, normal social life will be difficult. Therefore, the importance of preventing oral diseases has been emphasized because oral morbidity causes oral cavity dysfunction. Dental caries is a disease caused by the oral bacteria that leads to tooth structure destruction and loss. S. mutans, a bacterium that produces acids on the teeth’s enamel surface, forms an insoluble glycoprotein membrane with sugar as a nutrient, and minerals are demineralized over time due to the high acidity of the dental plaque . The inhibition methods for dental caries include the mechanical removal of the dental plaque; the use of non-or low-dental-carries-inducing sweeteners, including dietary life improvement; the use of antimicrobial agents and dental plaque inhibitors; and the development of vaccines against microbes causing dental caries . Since recently, there has been a growing interest in oral therapeutic agents that can be used safely, without the usual side effects of drugs. In particular, research on and development of next-generation antibacterial materials with selective effects on oral bacteria are further demanded. There is also a growing interest in natural substances that can be used for the prevention of dental caries or periodontal diseases, which are associated with dental plaque, and the interest in natural antimicrobials as next-generation antibiotic materials is increasing . Of the various natural medicinal plants, Glycyrrhiza uralensis has been recognized for its efficacy since the olden times, and is an easy-to-use plant due to the easier access to it compared to the other plants that are being commercialized. Glycyrrhiza uralensis can be found in China, Russia, and Spain, and the species include Northeast Glycyrrhiza uralensis, Northwest G. glabra, Shingang G. inflate, and Spain G. glabra var typical [25,26]. Glycyrrhiza uralensis contains sugars, starches, proteins, flavonoids, saponoids, essential oils, etc., in addition to glycyrrhizin. Glycyrrhizin does not dissolve well in cold water or ethanol and has a good melting property in hot water. It is 50 times sweeter than sugar and is mainly used as a sweetener in the West . For the pharmacological actions of Glycyrrhiza uralensis, it is generally known to be anti-inflammatory, antiulcerative, and anti-allergic, and to have anti-hepatitis, antiarteriosclerosis, antitumor, and antiviral effects. Many studies on Glycyrrhiza uralensis extract as well as its fraction and ingredients have been conducted, and the anti-inflammatory, detoxifying, and steroid-like effects of glycyrrhizin, one of Glycyrrhiza uralensis’s main ingredients, have been reported [28-31]. According to Ahn et al., the distinct antimicrobial activity of the 75% ethanol extract of Glycyrrhiza uralensis has been recognized for five strains of L. monocytogenes, and it showed a growth inhibition effect on Staphylococcus aureus (S. aureus) . According to the report of Sung et al., Glycyrrhiza uralensis extract showed an antimicrobial effect on microbes (Salmonella typhimurium and fungus) with the lapse of the incubation time in the antimicrobial experiment . The study of Kim et al. revealed that isoliquiritigenin, the ingredient of Glycyrrhiza uralensis with the highest antimicrobial activity, has antimicrobial activity against four kinds of bacteria: B. subtilis, P. acanes, E. coli, and P. aeruginosa . Therefore, this study was conducted to investigate the antimicrobial effect of Glycyrrhiza uralensis extract on S. mutans, which causes dental caries, and to develop a natural antimicrobial substance that is effective for the prevention and treatment of dental caries and that has less side effects and tolerance. As a result, the clear zone of Glycyrrhiza uralensis extract on S. mutans was determined to be 0, 1, 13, 14, 16, and 18 mm at 0, 2, 4, 6, 8, and 10 mg/ml, respectively. As for the antimicrobial effect of Glycyrrhiza uralensis extract, the higher the concentration was, the wider the inhibition zone. For the CFU, as the concentration of Glycyrrhiza uralensis extract increased, the bacterial count decreased. Bacteria did not grow at 10 mg/ml, and the growth of S. mutans was inhibited from 2 mg/ml in the growth curve. This result showed that a distinct antimicrobial effect started to appear from 2 mg/ml Glycyrrhiza uralensis extract and that there was no bacterial growth at 10 ml/ml. Based on the above results, it was confirmed that Glycyrrhiza uralensis extract, among the natural extracts, has a definite antimicrobial effect on S. mutans. It will contribute to oral health promotion as a safe and effective natural antimicrobial agent for anti-dental caries. Glycyrrhiza uralensis extract showed growth inhibition from a concentration of 2 mg/ml. The higher the concentration of Glycyrrhiza uralensis extract is, the higher its killing effect on S. mutans. Consequently, Glycyrrhiza uralensis extract not only inhibits the growth of S. mutans but also has a killing effect on it, while exhibiting an apparent antimicrobial effect. As such, Glycyrrhiza uralensis extract is expected to effectively prevent dental caries. The authors report no conflict of interest related to this study and no financial interest in the companies whose materials are included in the article. Zaura E, Keijser BJ, Huse SM. Crielaard W. Defining the healthy core Microbiome of oral microbial communities. BMC Microbial 2009; 9: 259. Kroes I, Lepp PW, Relman DA. Bacterial diversity within the human subgingival crevice. Proc Natl Acad Sci USA 1999; 96: 14547-14552. Paster BJ, Boches SK, Galvin JL, Ericson RE, Lau CN, Levanos VA, Sahasra Budhe A, Dewhirst FE. Bacterial diversity in human sub-gingival plaque. J Bacteriol 2001; 183: 3770-3783. Petersen PE. Challenges to improvement of oral health in the 21st century-the approach of the WHO Global Oral Health program. Int Dent J 2004; 54: 329-343. Botelho MA, Nogueira NAP, Bastos GM. Antimicrobial activity of the essential oil from Lippa sidoides, carvacrol and thymol against oral pathogens. Braz J Med Biol Res 2007; 40: 349-356. Cha JD, Jeong MR, Jeong SI, Lee KY. Antibacterial activity of sophora flavanone G isolated from the roots of Sophora flavescens. J Microbiol Biotechnol 2007; 17: 858-864. Chen TH, Hsu YT, Chen CH, Kao SH, Lee HM. Tacashinone IIA from salvia miltorrhiza induces heme oxygenase-1 expression and inhibits lipopolysaccharide-induced nitric oxide expression in RAW 264.7 cells. Mitochondrion 2007; 7: 101-105. Mosci F, Perito S, Bassa S, Capuano A, Marconi PF. The role of Streptococcus mutans in human caries. Minerva Stamatol 1990; 39: 413-429. Lee YS, Park HJ, You JS, Park HH, Kwon IB, Lee HY. Isolation of anticariogenic compound from Magnoliae bark. Kor J Food Sci Technol 1998; 30: 230-236. Park CS, Shin YS. Effect of Phellodendri cortex L on the activity of glucosyltransferase and human gingival cell, growth and membrane permeability of S. mutans JC-2. Korean J Acad Dent Health 1995; 19: 447-456. Koo H, Gomes BP, Rosalen PL, Ambrosano GM, Park YK, Cury JA. In vitro antimicrobial activity of propolis and arnica Montana against oral pathogens. Arch Oral Biol 2000; 45: 141-148. Lee SY, Kim JG, Baik BJ, Yang YM, Lee KY, Lee YH, Kim MA. Antimicrobial effect of essential oils on oral bacteria. J Kor Acad Ped Dent 2009; 36: 1-11. Park UY, Kim YM, Kim SH, Chang DS. Investigation of optimum extracting condition and antimicrobial activity of the extract from the root bark of Morus alba. J Food Hyg Safety 1995; 10: 139-145. Chung KH, Lee SH, Lee YC, Kim JT. Antimicrobial activity of omija (schizandra cheinensis) extracts. J Korean Soc Food Sci Nutr 2001; 30: 127-132. Jung GT, Ju IO, Choi JS, Hong JS. The anti-oxidative antimicrobial and nitrite scavenging Effects of Schizandra chinensis RUPRECHT (Omija) seed. Korean J Food Sci Technol 2000; 32: 928-935. Jang JK, Han JY. The antioxidant ability of grape seed extracts. Korean J Food Sci Technol 2002; 34: 524-528. Sung KC. A study on the pharmaceutical characteristics & analysis of Glycyrrhizin extract. J Korean Oil Chemists Soc 2006; 23: 215-222. Kim HJ, Jang HN, Bae JY, Ha JH, Park SN. Antimicrobial activity, quantification and bactericidal activities of Licorice active ingredients. Korean J Microbiol Biotechnol 2014; 42: 386-392. Shin DH, Han JS, Kim MS. Antimicrobial effect of ethanol extracts of Sinomenium acutum (Thunb.) Rehd. et Wils and Glycyrrhiza glabra L. var. Glandulifera Regel et Zucc on Listeria monocytogenes. Korean J Food Sci Technol 1994; 26: 627-632. Kim MS, Lee DC, Hong JE, Chang IS, Cho HY, Kwon YK, Kim HY. Antimicrobial effects of ethanol extracts from Korean and Indonesian plants. Korean J Food Sci Technol 2000; 32: 949-958. Adams JD, Wang R, Yang J, Lien EJ. Preclinical and clinical examinations of salvia miltiorrhiza and its tanshinones in ischemin conditions. Chin Med 2006; 1: 663-694. Kim YJ, Cha JD, Kim JY, Kim GJ, Lee HS. Effect of potassium alum and sugar substitutes on the growth of Streptococcus mutans. J Korean Acad Oral Health 2003; 27: 459-469. Kim GJ, Lee GS, Park JS. Dental microbiology. Dae Hag Sa 2000; 21-284. Pai MR, Acharya LD, Udupa N. Evaluation of antiplaque activity of Azadirachta indica leaf extractgel-a 6-week clinical study. J Ethnophamachol 2004; 90: 99-103. Kitagawa I, Wei-Zhong C, HE N, Harada E, Yasuda N, Yoshikawa M, Jiali, REN. Chemical studies of Chinese licorice-roots. I. Elucidation of five new flavonoid constituents from the roots of Glycyrrhiza glabra L. collected in Xinjiang. Chem Pharm Bull (Tokyo) 1994; 42: 1056-1062. Hayashi H, Fukui H, Tabata M. Examination of triterpenoids produced by callus and cell suspension cultures of Glycyrrhiza glabra. Plant Cell Rep 1988; 7: 508-511. Hayashi H, Fukui H, Tabata M. Distribution pattern of saponins in different organs of Glycyrrhiza glabra. Planta Med 1993; 59: 351-353. Hsiang CY, Lai IL, Chao DC, Ho TY. Differential regulation of activator protein 1 activity by glycyrrhizin. Life Sci 2002; 70: 1643-1656. Narita M, Nagai E, Hagiwara H, Aburada M, Yokoi T, Kamataki T. Inhibition of β-glucuronidase by natural glucuronides of Kampo, medicines using glucuronide of SN-38 (7-ethyl-10-hydroxycamptothecin) as a substrate. Xenobiotica 1993; 23: 5-10. Shoji S. A drug over the millennia: pharmacognosy, chemistry, and pharmacology of licorice. Yakugaku zasshi 2000; 120: 849-862. Shingo Y, Masatoshi H, Kazuo W, Koichi N, Yoshifumi H, Shoji S, Kunio T, Takeo M, Kazuhiro H, Midori T, Nobuyuki N. Antiulcer activities of Glycyrrhetinic acid derivatives in experimenta glastric lesion models. Chem Pharm Bull (Tokyo) 1989; 37: 2500-2504. Ahn EY, Shin DH, Baek NI, Oh JA. Isolation and identification of antimicrobial active substance from Glycyrrhiza uralensis FISCH. Korean J Food Sci Technol 1998; 30: 680-687.